If you’re wondering how to choose the best night vision goggles, you’re in luck. We had our experts research and review night vision equipment to help you find the perfect pair. Whether you’re going camping, hunting, need the goggles for work or just want them for entertainment, our list has something to suit you. We identified a list of specifications, so you know what to look for when making your choice. Let’s get started! Battery: It’s a good idea to keep in mind the type and number of batteries needed to power each model before you make your choice. Check this spec for information on what it takes to keep the goggles working. Age: We’ll let you know if the style you’re eyeing is suitable for kids or adults. 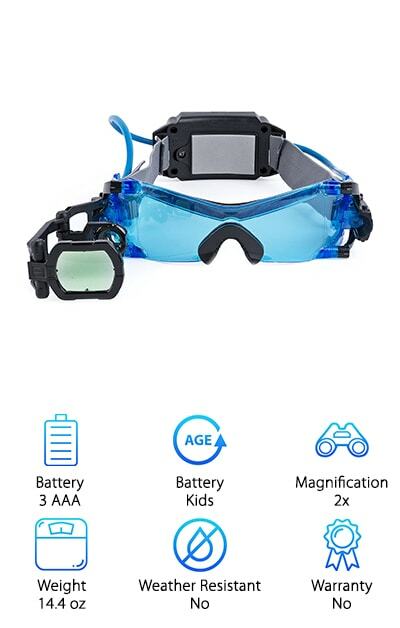 If you need goggles for the whole family, or if you’re just in the market for yourself, this spec has got you covered. Magnification: Whether you are looking for maximum magnification, as in binoculars, or minimal, as in a monocular for head mounting or hunting, this spec will be helpful. When searching for night vision goggles for security or safety reasons, you want to be sure you get a pair with the best night vision scope. Weight: Comfort is key, so we researched how heavy each pair of goggles is. If you’re curious about how the style you like weighs in, check this spec for the details and to make sure you get the perfect fit. Weather Resistant: When you’re in the market for goggles that are weather resistant, you’re going to need a durable pair of outdoor, waterproof night vision equipment. Check this spec to determine how resilient each option is. Warranty: Goggles are an investment. This spec lets you know if the manufacturer offers a warranty, so you can make an educated choice before you purchase. Now that you know what to look for when you’re in the market for a pair of high quality night vision goggles, you’re ready to start shopping. Our experts searched far and wide to bring you a list of the top ten best goggles to help you make an educated decision before you purchase. We want you to end up with a pair that features everything you want and need. If you’re in a hurry, check out our top and budget picks. Let’s get to it! Our number one pick, the Yukon NVMT, has so many awesome features it qualifies as our favorite pair of top rated night vision goggles. This luxury set comes with a protective carrying case and a wrist strap. It features hands-free operation, two built-in tripod sockets, an illuminator focusing beam, and integrated LED indicators. The Yukon is also weather-resistant and photo and video equipment compatible, making this pair among the best digital night vision goggles. But wait, it gets even better! Users are able to enhance their night vision experience by activating the illuminator focusing beam, which pulsates with infrared technology. Additionally, the monocular can be taken off the headpiece and used as a handheld device. This is a great feature when the situation calls for a flashlight over a headpiece. If you’re looking for the best in night vision technology and don’t want to sacrifice on any specification, you’ll definitely want to check out the Yukon. Our pick for the best budget night vision goggles is the Spy Net Ultra. The Spy Net Ultra offers a range of great features at an affordable price, so you can be sure you’re still getting a nice pair of goggles without paying through the roof. Spy Net allows you to see up to 50 ft. in complete darkness and even features an enhanced daytime vision mode, complete with infrared technology. But that’s not all! You can record video and photos in both vision modes, letting you relive your surveillance experiences. The Spy Net goggles are great as a gift for a kid or teen looking to simulate their favorite video games and action movies, but the technology behind them is also adequate for anyone with night viewing needs. Two surveillance ranges allow you to zoom in from multiple distances in pitch black environments. When you’re on a budget, Spy Net has your night viewing needs covered. If you’re seeking some serious goggles that compete with military-style products, you should look into Armasight. A pair of bi-ocular night vision goggles built around image intensifier tubes, Armasight is equipped with high-grade optics, a range of lenses, and wide angle infrared IR illuminators for long-range use. These babies also come with an Improved Definition Gen 2+ tube, providing resolution of 47-54 lp/mm. Water-resistant, lightweight, and with multiple uses, such as handheld, head-mounted, or helmet-mounted, the Armasight model is among the best night vision goggles money can buy. Additional features include flip-up headgear, multi-coated all-glass optics, and auto brightness control. Water and fog don’t stand a chance against these weatherproof goggles, which let nothing stand in the way of your line of sight. 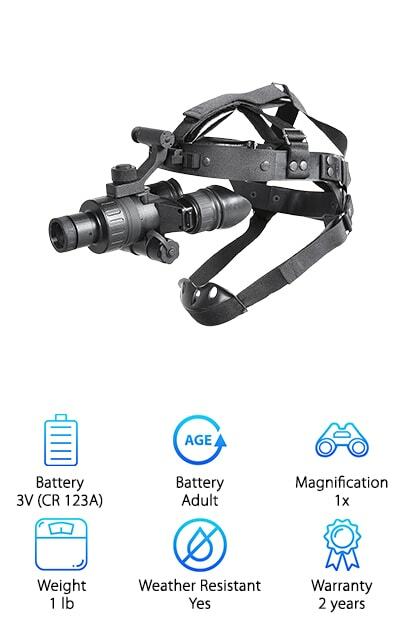 If you’re ready to invest in top quality night surveillance and you want a pair of goggles with extra features, look no further. 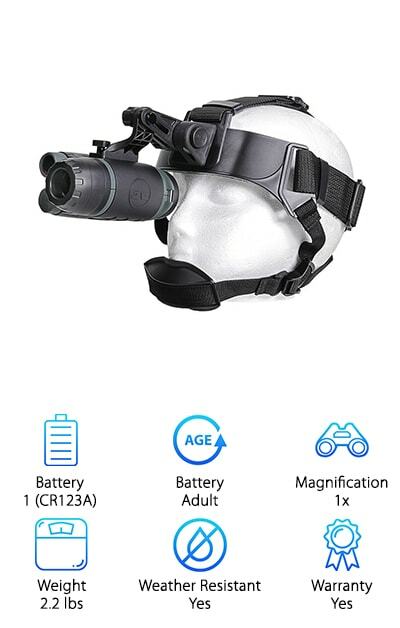 If you’re in the market for the best cheap night vision goggles for kids, Spy Gear has you (and your secret agents) covered. Featuring two LED blue lights and tinted lenses to enhance night vision, the Spy Gear goggles illuminate dark rooms, helping kids navigate and play. Collapsible zoom lenses provide magnification as an added viewing feature and a flip-out scope allows kids to focus on objects of interest. Spy Gear comes with an adjustable head strap, so the perfect fit comes easy. Head-mounted lights make kids feel authentic and free up their hands for additional activities. 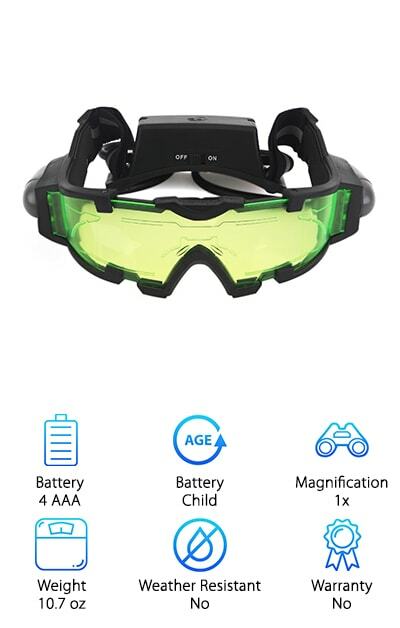 Spy Gear goggles are sure to be a hit for gamers and kids who love imaginary play, so don’t miss out on these awesome night vision glasses. Transform your living room into a secret agent’s lair today without spending a fortune and watch their faces light up as they enjoy a realistic night surveillance game. Night Owl makes a comfortable, compact, and military-style set of night-vision goggles. This model comes complete with a quick-release hinge that allows the wearer to swiftly detach the lens for use as a handheld binocular. Equipped with 1x magnification, a 26mm objective lens, and a 455-foot viewing range, we consider the Night Owl model to be among the best night vision goggles for the money available today. The 1.4 F lenses give Night Owl superior depth perception, allowing you to see through even the darkest of environments. Other features include an infrared illuminator, a bright light protection circuit, and precision-machined aluminum housing and lens bodies. Durable and professional, Night Owl does not sacrifice comfort. Adjustable straps help you achieve the perfect fit. 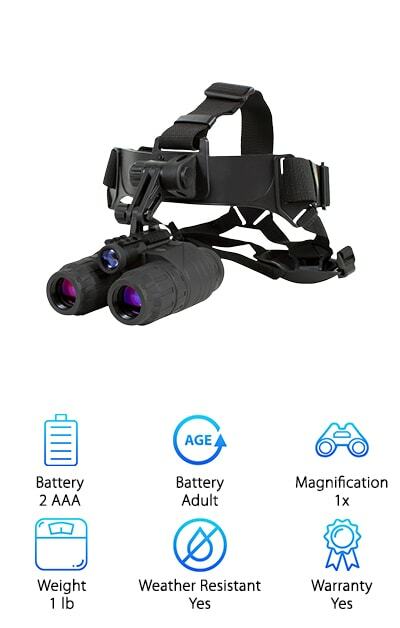 If you’re looking for a versatile pair of night surveillance goggles that will have you covered in a variety of situations, Night Owl is the perfect choice for you. Surprise your favorite gamer or creative thinker with a cool pair of Edu Science goggles. These 3D night vision goggles are equipped with two sets of lenses to aid in night vision and simulate a 3D effect. The green-tinted lenses, accompanied by a built-in green flashlight, help kids see in the dark. The set of red and blue lenses make 3D pictures pop! An additional built-in white flashlight provides added illumination to any environment. The multiple lenses and flashlights offer unique experiences, encouraging kids to use their imaginations in a wide variety of settings. The hands-free design allows them to play and explore while simulating the experience of authentic night vision goggles. These Edu Science goggles are a must-have for the children in your life who love imaginary play. If you’re in the market for a great surprise gift, or your child specifically asked for a pair of night vision glasses, these are a great option! When it comes to the best rated night vision goggles, you can’t go wrong with the Firefield model. Firefield made our list of awesome night surveillance options due to its military-style features and its affordable price. Equipped with a 1X24 night vision monocular that provides a superior view with crystal clear depth perception, this hands-free pair of goggles is durable and coated with rubber armor to protect it in its entirety from weather conditions and dirt. 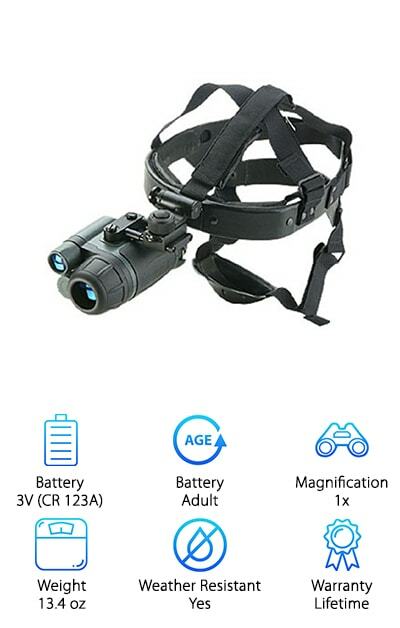 An IR illuminator uses a pulsating infrared beam to enhance your night viewing experience and a detaching mechanism allows the monocular to be removed and used as a handheld device. But it gets even better! The Firefield offers users all the features you need when camping, hiking, or hunting in a lightweight and durable headpiece that can be adjusted for the perfect fit. When you’re braving the outdoors, you want to be sure your equipment can handle the rugged atmosphere. Firefield delivers everything you need with style and ease. Sightmark manufactures some of the best affordable night vision goggles available today with its Ghost Hunter model. As the name suggests, the Sightmark goggles offer clear, precise vision in pitch black environments and help you see even the slightest and fastest images. The high quality image and resolution combined with a lightweight, durable plastic construction make Sightmark an ideal pick for anyone looking for quality, heavy-duty goggles. A built-in IR Illuminator and 1X magnification, combined with the dual-tube system, make for comfortable, detailed viewing at both short and long-range distances. If you’re seeking a versatile pair of goggles that won’t break the bank, Sightmark delivers. 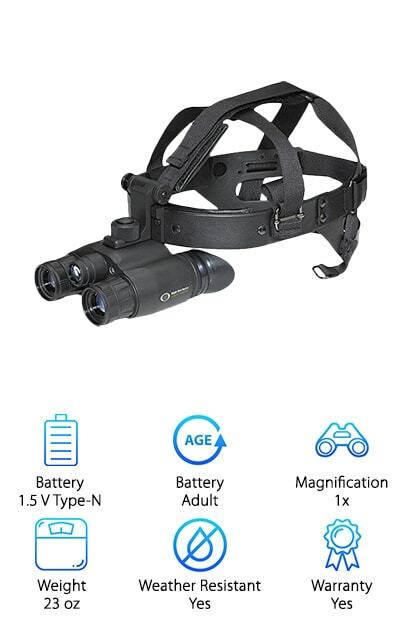 Sold as a hands-free model, the multifunction binoculars can detach from the headpiece and be used as a handheld device. Whether you’re hunting, camping, or looking for a premier set of night surveillance goggles for security reasons, Sightmark delivers top-quality features in an easy-to-use, light, and tough model. 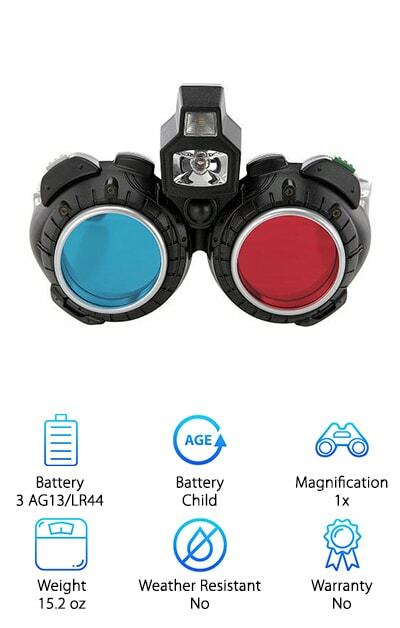 If you’re in the market for the best value night vision goggles for kids, look no further. Your child is sure to feel like a super spy while wearing these awesome, affordable sleuth glasses. The AGM goggles are equipped with green lenses and glowing etched graphics, providing a cool effect that makes kids feel like authentic secret agents. Flip-out flashlight beams, attached to the sides of the lenses, provide blue light. Kids are able to see 25 feet in front of them while wearing these, even in a dark room! Adjustable elastic bands ensure the perfect fit, so your child can move around in comfort without the goggles falling off. A soft nose pad keeps the goggles sitting gently on the bridge of the nose. 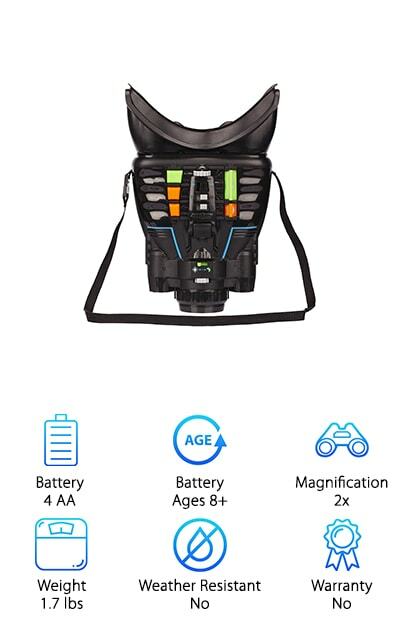 The hand-held design allows kids full use of their hands, so they can play and explore while enjoying night vision capabilities. If you’re in the market for the perfect gift for your favorite spy, you found it! The Spin Master night vision goggles are sure to make your favorite spy the envy of every kid at school! 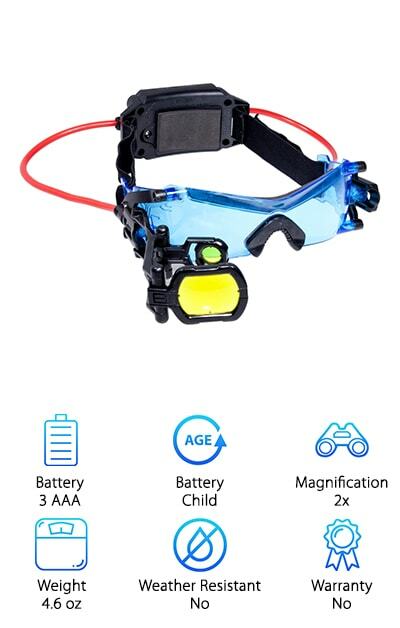 Equipped with bright LED lights and blue-tinted lenses to enhance night vision, even grown-ups feel awesome wearing a pair of Spin Master goggles. A yellow foldout scope and 2X magnifying lens help secret agents spot targets from a distance at night and bring to mind some of your favorite video game characters. Best of all, the hands-free design allows kids to play and move around. The headset is comfortable, with a smooth-edge nosepiece and adjustable strap. Indeed, the Spin Master can’t be beat when it comes to authentic and comfortable night surveillance wear for kids. When you’re looking for an awesome gift at an unbeatable price, Spin Master goggles are sure to be a hit for all. Keep your favorite secret agent smiling and exploring in style.